Retail is constantly in flux. New players come in and make their mark on the industry, while old established brands are forced to adopt an innovate-or-die mentality. There is always a handful of top retailers that are not only prospering economically, but driving the industry forward through the leading-edge use of technology. 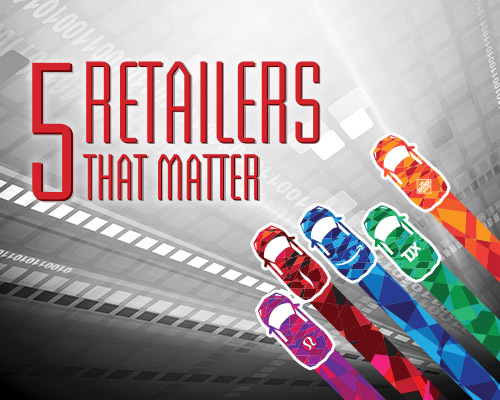 These are the retailers that we explore in this issue’s cover story entitled the 5 Retailers That Matter. Deciding on the five retailers to examine for this feature involved a fair amount of deliberation. And the decision to include one retailer and exclude another could be debated, but one thing is certain: all five retailers that made the final cut truly matter. They are all in growth mode. Sales are steadily increasing. And they are investing heavily in technology to redefine the shopping experience and meet ever-changing consumer demand. A deep dive look at the five retailers included in this annual feature can be found here. Amazon. Tough to argue with the inclusion of Amazon. The online giant is the industry’s most disruptive force and is redefining not only how retailers operate but shoppers’ expectations of what a retailer should be. With its dominance in the digital space secure, Amazon is turning its attention to physical retailing where its Go technology will likely have a lasting impact on the in-store experience. Sephora. The cosmetics retailer has forever changed the way consumers shop for makeup. Thanks to a host of new mobile and artificial intelligence innovations shoppers can now virtually try on thousands of shades of makeup without ever leaving the comfort of home. While in-store, shoppers can leverage their personal mobile device to access reviews and ratings on thousands of SKUs. TJX. While many apparel-focused retailers have fallen on hard times, TJX is enjoying unprecedented success, highlighted by 21 consecutive years of comp sale gains. The parent company of TJ Maxx, Marshalls and Home Goods has helped usher in the age of the discount shopper, and its treasure-hunt-style and in-store experience continues to connect with consumers and siphon market share from traditional department stores. Home Depot. The home improvement retailer is coming off of its most successful year ever, reaching a record setting $94.6 billion in sales in 2016. The Home Depot’s recent success is two-fold. First, the housing market is booming, which always spells good fortune for do-it-yourself retailers. Second, the retailer’s continued investment in its interconnected retail initiatives is blurring the distinction between physical and digital. Lululemon. The athletic-wear retailer continues to see its business increase, and is on track to meet its stated goal of doubling revenue over the next five years. Lululemon’s consumers have fully embraced the shop from anywhere model, and the retailer is fortifying the enterprise with next-gen tech to ensure a seamless experience. Thanks to a chain-wide RFID deployment Lululemon how enjoys 98% inventory accuracy at the store level.